Whether you love sports or simply need a reason to throw a party, football Sunday is your chance. It’s an ideal time to get your friends together, dish out your best appetizers and gather in your freshly designed entertainment room. Looking to add a sophisticated twist to the celebration? Perhaps your own bar cart can make your party unique and keep the guests coming back every week of the season. If you’re interested in treating your friends and making a fun and exciting statement at your house, consider this: Keep BYOB off the invitations and try creating your own convenient bar cart for game day! Decide what type of piece you want to use for displaying your beverages. Some may be looking for a vintage barrel, while others are more interested in a modern cart. Think about how this statement piece will flow with the rest of the room’s design and decor before making your decision. And make sure it has wheels: A mobile cart is more functional and convenient for everyone! 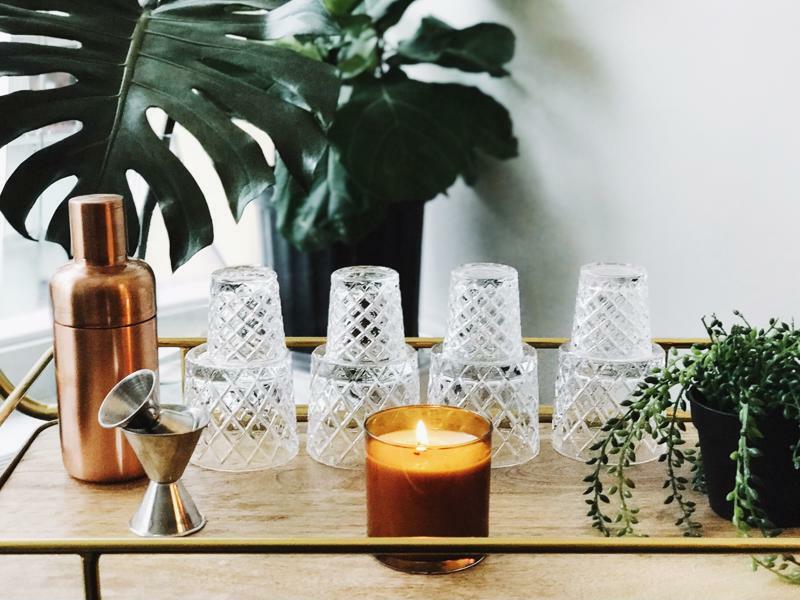 Just as you decorate rooms with eye-catching and functional accessories, your bar cart will make an unforgettable impression when it’s adorned just right. Color, pattern and texture are all important when designing your cart! Keep this in mind when choosing your glassware, napkins, coasters, mixing utensils and other accessories needed to craft the perfect game day cocktail. Search for packaging that will express your style seamlessly. And don’t forget to fill in the blanks with non-beverage related adornments. Perhaps a small, modern globe follows your home’s decor. Or, a trendy vase of seasonal flowers brings everything together. Choose accessories that flow with the room. Since you’re creating this bar cart for game day, make sure to reach out to your guests about what they want to drink. Consider asking your friends to RSVP with their favorite cocktail. Then, you can grab all of the ingredients needed to keep everyone satisfied. Add a unique touch to the party by creating a house drink and have all of the ingredients stocked for each game day get-together. You can’t just throw glassware, liquor bottles and accessories on your cart and call it a day. Roxy Owens, owner of lifestyle brand Society Social, suggested placing trays on your cart for a seamless and functional touch. The level of organization will unite the look and show your guests you paid attention to style and detail in creating this unique entertainment piece. Remember: Your bar cart should flow with the overall theme and style of the room in which you choose to entertain your guests. If you need help matching this new item with your home, contact a personal decorator from Decorating Den Interiors. He or she can come to your home for a free consultation and provide insight based on your personal style and ideas. From there, he or she will suggest the type of cart, beverages, cart accessories and more based on the look and feel you’re trying to achieve. While we’re a couple of months into the football season, there are plenty more game days left until it comes to a close! Contact your design consultant from Decorating Den Interiors today to get down to decorating.